Halfway to Houston! 8 weeks down, 8 weeks to go! I have 5 more weeks of hard work followed by 3 weeks of taper and then it’s race day! Training has been going by SO FAST and I am feeling SO GOOD. 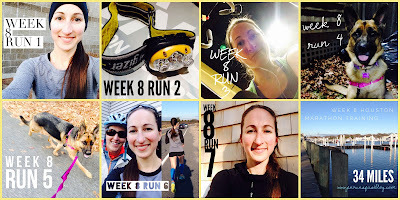 I was nervous heading into this week, as it was my highest mileage week and longest long run in my training. I started out with 4 miles on Monday and Run Club on Tuesday. Oh my god it was cold on Tuesday night but it was Dave’s birthday so we couldn’t miss. Wednesday I had my first real workout planned. 4x800s at 10k pace (7:00) with recovery at marathon goal pace (8:00). I really wanted to take my time with this and not feel rushed so I opted for the treadmill. If you’ve been following along, I am not a fan of the treadmill but I thought it would also give me a really good idea of where I’m at with a steady, set pace in a controlled environment. It went by surprisingly fast. Incline set to 1.5, warm up/recovery/cool down at 7.5mph and half mile repeats at 8.5mph, 8.5mph, 8.6mph, 8.8mph. That same night I went home and took Georgie out for a mile. It was dark out and she did awesome! We ran the mile in 8:40 and only made ONE quick bathroom stop. She was totally focused in the dark with no sniffing and hardly any distractions. A late Friday morning phone call from Lindi Lou lead to a change in weekend long run plans. It was a crappy morning but the afternoon turned out to be beautiful. The sun came out and there was a slight breeze. She offered to ride with me on Friday if I wanted to get it over with and that’s exactly how I looked at it—let’s just get it over with! I felt great. The last 3 miles were a bit of a struggle but that was expected. My goal was 8 minute pace (2:08:00) and I ended up running 2:07:52. Right on! It was wonderful going to bed on Friday night knowing I only had a short run planned for Saturday. 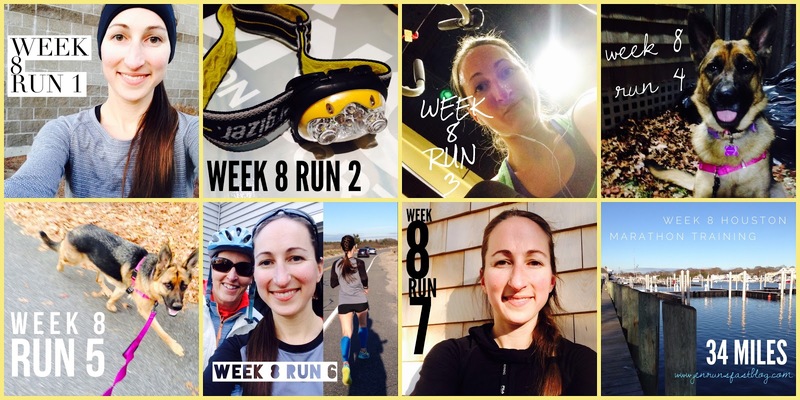 · 8 weeks until the Houston Marathon!